We headed back down the river, the way we came when we first arrived. 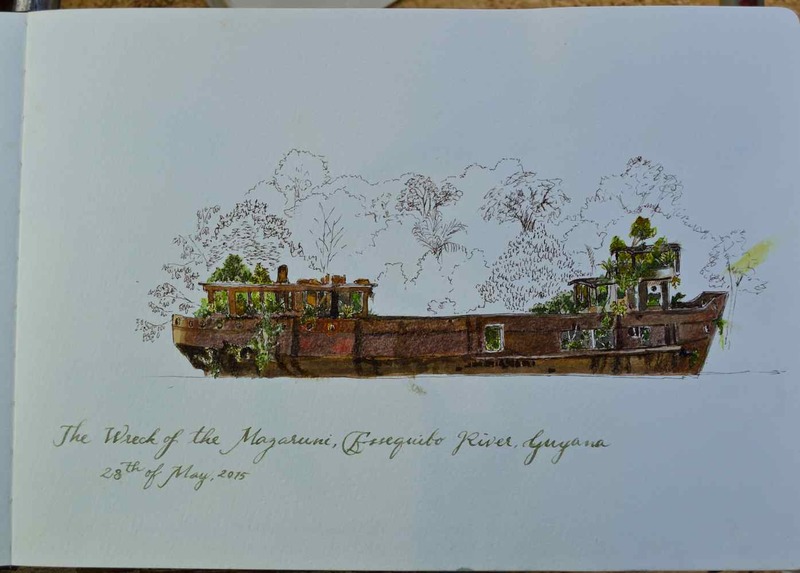 We’d seen a wrecked ship along the banks, halfway down, that had fascinated us…the jungle was taking it over, growing over its bridge and filling the cracks in its hull with vines and ferns. So we headed for the same spot, and anchored for two days near the wreck of the ship “Mazaruni”. 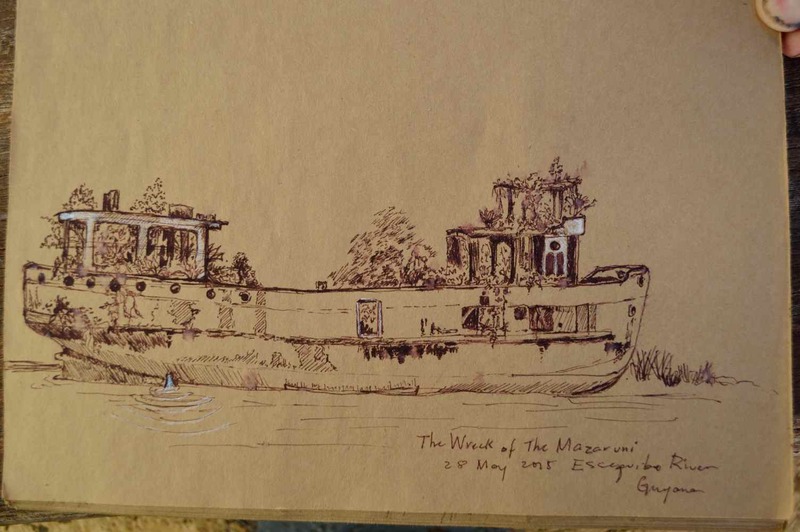 Of course, the first thing I did was sketch the ship…once, in pen on brown bag paper, and then a (less successful) watercolour, in a brand new sketchbook that I had bought at the Darwin airport to use up my Aussie dollars, and decided to finally use. Kris, on the other hand, went exploring in the dinghy…around the ship, and discovered a creek that ran behind it. Up the creek he saw Morpho butterflies (common in Guyana, but magical nonetheless…Vladimir Nabokov collected these iridescent blue butterflies. These days they are being farmed for jewelry and collectors, so the wild population has managed to recover from the past centuries’ mania for naturalist collections) and a large boa constrictor. We started calling the creek Gabriel’s Creek, after a scene from Gabriel Garcia Marquez’ One Hundred Years of Solitude, where Jose Arcadio Buendia and his band of men come upon a galleon smothered in jungle, miles away from any sea. I concur with your opinion of the Moleskein, sadly. Love your work! I’ve used moleskines in the past (purchased from Amazon.com at a discount) and I’ve noticed that the paper quality has dropped. I’ll add that I was too cheap to buy more than four/five of them out of a total collection of sketchbooks that number maybe twenty-twentyfive; I’m not an expert on moleskines. Either way I’ve stopped using them. My next watercolor book I’ll make by hand: I can control the quality and size that way and making books is not as difficult as one might think! I’ve enjoyed reading and lurking for a while. :-). 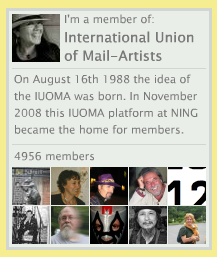 Thanks for your posts about your journeys! I love your art. What a gorgeous sketch. How cool to find a wreck that is being gradually consumed by the jungle. I can see why that would inspire you. I too like the brown bag version best. I think the line drawing makes it a more focused, stronger piece. I think, too, that the pristine white first page of that over-priced sketchbook cramped my freedom of expression in the second one! 🙂 Cheap and nasty is so liberating! Thank you, as always, for dropping by! Ah, I love your comments, thank you, so glad you’re along for the ride! Hi, Kate, I think it’s a widget at the very bottom of the page…let me know if it still doesn’t work.